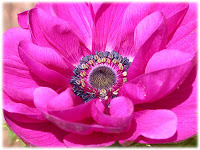 Anemone (A-ne-mó-ne, from the Gr. Άνεμος, wind), is a genus of about 120 species of flowering plants in the buttercup family Ranunculaceae in the north and south temperate zones. 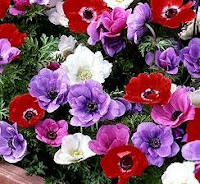 Mythology: It is said that the goddess Flora was jealous of her husband's attentions towards the nymph Anemone and so transformed her into the wind flower and left her at the mercy of the North Wind. Medicinal: Used for cramping pains, menstrual problems and emotional distress. Colour: Vibrant shades of red, purple and pink, with jet black hearts ringed with white. The all-white anemone is rare, it has a yellow-green heart. Here they are in mixed with pink sweet williams made from a Mary Kinloch kit.